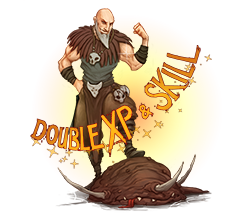 In order to make the waiting time for the upcoming winter update more bearable there will be a double XP and double skill weekend coming to Tibia. Use it to train your body and mind to protect yourself from the nightmarish dangers you will soon have to face! Between the server saves of November 02 and November 05, all monsters will yield twice the usual amount of experience points, and your skill training, including magic level, will advance twice as fast. The skill progress when training offline will also be doubled.